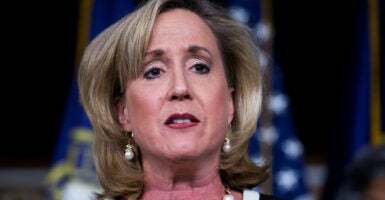 Rep. Ann Wagner, R-Mo., was part of a Heritage Foundation panel discussion on how conservative economic policies benefit women. (Photo: Tom Williams/CQ Roll Call/Newscom). The best way to empower women is through conservative policies such as tax reform, four Republican congresswomen say. Noting that most women are responsible for household finances and health care decisions, and that female-owned businesses employ more than 8.4 million people, the GOP lawmakers explained their support for tax relief and tax reform at a recent Heritage Foundation event. The Republican-led Congress enacted the Tax Cuts and Jobs Act signed into law just before Christmas by President Donald Trump. “Now, they’re investing in their employees,” she said. Overhauling the tax code has allowed small businesses to move from survival mode to “dream” mode, McMorris Rodgers said during the panel discussion at The Heritage Foundation in observance of Women’s History Month. Reps. Mia Love, R-Utah; Martha Roby, R-Ala.; and Ann Wagner, R-Mo., also took part in the March 15 event before a mostly female audience. The panel also discussed another measure, the Working Families Flexibility Act sponsored by Roby. The bill would allow private-sector employers to offer employees the choice of paid time off in lieu of cash wages for overtime hours worked. That would give working mothers and fathers the opportunity to spend more time with their children. The Heritage event concluded with each congresswoman leaving the women in the audience with a piece of advice. They all insisted that the nation needs more women in public service.